The discovery of Tashfeen Malik’s old social-media posts about her views on violent jihad has exposed a significant — and perhaps inevitable — shortcoming in how foreigners are screened when they enter the United States. 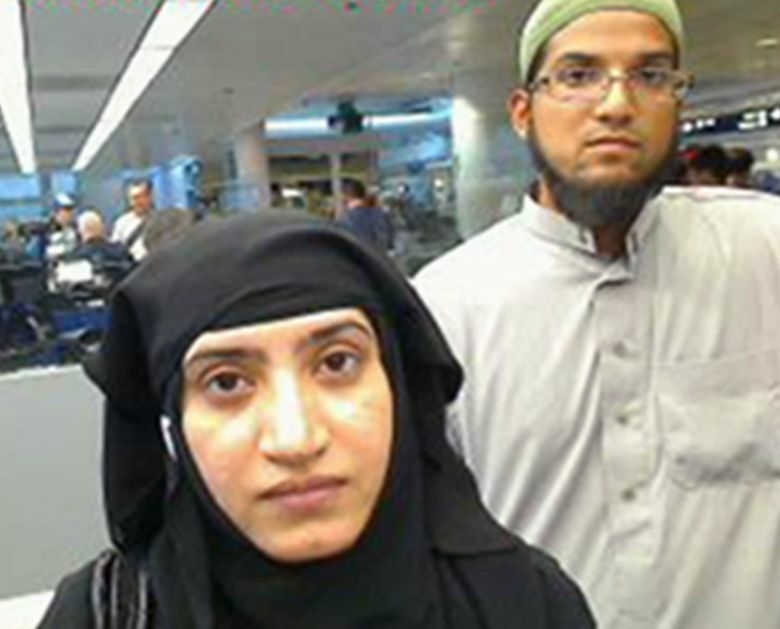 WASHINGTON — Tashfeen Malik, who with her husband carried out the massacre in San Bernardino, Calif., passed three background checks by U.S. immigration officials as she moved to the United States from Pakistan. But none uncovered what Malik had made little effort to hide — that she talked openly on social media about her views on violent jihad. U.S. law-enforcement officials said they recently discovered those old — and previously unreported — postings as they pieced together the lives of Malik and her husband, Syed Rizwan Farook, trying to understand how they pulled off the deadliest terrorist attack on American soil since Sept. 11, 2001. Had authorities found the posts years ago, they might have kept her out of the country. But immigration officials do not routinely review social media as part of their background checks, and there is a debate inside the Department of Homeland Security over whether it is even appropriate to do so. The discovery of the old social-media posts has exposed a significant — and perhaps inevitable — shortcoming in how foreigners are screened when they enter the United States. Tens of millions of people are cleared each year to come to this country to work, visit or live. It is impossible to conduct an exhaustive investigation and scour the social-media accounts of each of them, law-enforcement officials say. In the aftermath of terrorist attacks in San Bernardino and Paris, this screening process has been singled out as a major vulnerability in the nation’s defense against terrorism. Lawmakers from both parties have endorsed making it harder for people to enter the United States if they have recently been in Iraq or Syria. While President Obama has cautioned against “a betrayal of our values” in the way the United States responds to threats, he has ordered a review of the K-1 visa program, which allows foreigners like Malik to move to the United States to marry Americans, putting them on a pathway to permanent residence and, ultimately, citizenship. The Obama administration is trying to determine whether those background checks can be expanded without causing major delays in the program. In an attempt to ensure they did not miss threats from men and women who entered the country the same way Malik did, officials are also reviewing all of about 90,000 K-1 visas issued in the past two years and are considering a moratorium on new ones while they determine whether changes should be made. In an era when technology has given intelligence agencies seemingly limitless ability to collect information on people, it may seem surprising that a Facebook or Twitter post could go unnoticed in a background screening. But the screenings are an example of the trade-offs security officials make as they try to mitigate the threat of terrorism while keeping borders open for business and travel. Malik faced three extensive national security and criminal-background screenings. First, Homeland Security officials checked her name against American law-enforcement and national-security databases. Then, her visa application went to the State Department, which checked her fingerprints against other databases. Finally, after coming to the United States and formally marrying Farook, she applied for her green card and received another round of criminal and security checks. Malik also had two in-person interviews, federal officials said, the first by a consular officer in Pakistan, and the second by an immigration officer in the United States when she applied for her green card. All those reviews came back clear, and the FBI has said it had no incriminating information about Malik or Farook in its databases. The State Department and the Department of Homeland Security have said they followed all policies and procedures. The departments declined to provide any documentation, saying they cannot discuss the case because of the continuing investigation. Meanwhile, a debate is under way at U.S. Citizenship and Immigration Services, the agency that approves visas and green cards, over whether officers conducting interviews should be allowed to routinely use material gathered from social media for interviews where they assess whether foreigners are credible or pose any security risk. With that issue unresolved, the agency has not regularly been using social-media references, federal officials said. After the terrorist attacks in Paris last month, a furor arose over whether the United States should accept Syrian refugees. Governors in more than two dozen states balked at accepting any. But the vetting for refugees is a separate, longer and more rigorous process than the checks for K-1 and most other immigrant visas. And there is an extra layer of scrutiny for Syrians, who are referred to a national security and fraud office at the Department of Homeland Security for a final look. In that last step, officers can include a social-media search, federal officials said. Investigators are particularly interested in Malik’s life in Pakistan in the years before she moved to the United States. They believe that was when she was radicalized. From 2007 to 2012, she lived in a university hostel, then with her mother and sister Fehda at a family home in Multan, Pakistan. While there, Malik studied to be a pharmacist, and she took extra classes at the local branch of a women-only institute that teaches a strict literalist interpretation of the Quran, although it does not advocate violent jihad. In a brief telephone interview Saturday, the sister, Fehda Malik, said Tashfeen Malik was not an extremist, and she rejected the allegations against her sister. She said her sister was religious, studied the Quran and prayed five times a day. Social-media comments, by themselves, however, are not always definitive evidence. In Pakistan — as in the United States — there is no shortage of crass and inflammatory language. And it is often difficult to distinguish Islamist sentiments and those driven by political hostility toward the United States. At the time Fehda Malik’s comment was posted, anti-American sentiment in Pakistan was particularly high; four months earlier, U.S. commandos had secretly entered Pakistan and killed Osama bin Laden.